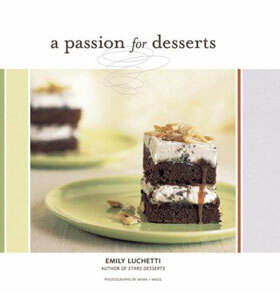 A Passion for Desserts by Emily Luchetti is my absolute favorite dessert cookbook! Not only are the recipes delectable, but there are also tons of beautiful pictures that accompany most of the instructions, which I like because cookbooks without images bug the crap out of me. The desserts take quite a while to prepare because everything is made from scratch, but it's well worth the effort. Besides, I kind of look at baking as a mini craft project, and I don't mind spending hours in the kitchen. If you have a couple hours to kill, try it some time. It's so much more rewarding than making something from a box mix!